We are now into the last quarter of the year, and I finally finished the first of my 2 vintage pledges for 2015. This is also the first of my A/W sewing plans, and it came from the "need" category. I'm feeling pretty smug right now. It won't last. My next project is already a bit questionable. But back to the dress in hand. 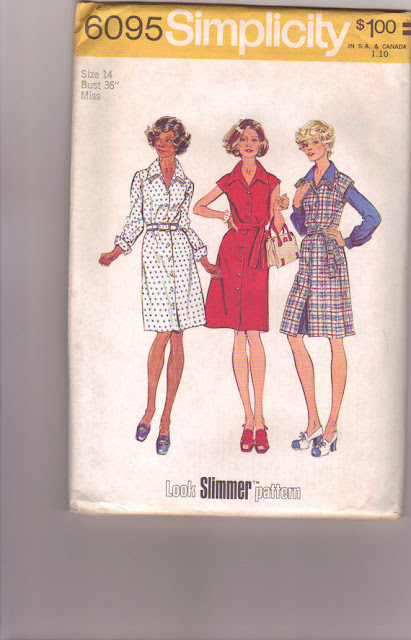 I came across this pattern last year when searching for a pattern from 1974 to make my 40th birthday dress. This pattern is from 1973, so didn't fit the bill, but I loved it so much, I bought it anyway. I made it part of my Vintage Pledge to stop it from becoming yet another unmade vintage pattern in my collection (I don't have many - maybe 15 or so, but I have to date only made 3). For ages, I couldn't see past the red dress on the cover artwork. It was always about the short sleeve dress for me, and the lady in red just looks so fabulous. But then, suddenly chambray popped into my head. This particular chambray was bought in Goldhawk Road during my visit to London in July. It cost me something like £12 for 2.5m. I like Goldhawk Road. Its a nice chambray. A little stiff, but it has a nice slubbiness and texture to it. Frayed like crazy though, and it creases pretty badly too. It was sunny! Far from ideal photo-taking conditions. Removed about half of the collar - taking out about 8.5cm in width. I actually used the collar pattern piece from the Archer shirt for the shape, as the original was also far too pointy. Took 14cm off the length, at the lengthen/shorten line. In the end, I think I overfitted it. It fits, particularly in the bodice, but it's a little neat over the hips and bum - most noticeable if I put my hands in the pockets. When making my muslin, I took it in at the back, but made a note to redistribute this 24mm across the front and back, so the side seams stayed in place. What I think I might have done is rather than redistribute, I've taken 24mm off the front and 24mm off the back. As I say, I can't remember, but this would explain why my collar piece then ended up being too long... Ahem. So, yeah, not a great collar, but not bad for my second ever attempt. The bust darts are a bit too long now, so could do with reducing by about 1-1.5cm, and for some reason they are not level. I can also see from these photos that there are serious draglines at the shoulders. I'm not sure if that's just from wear - I took these after wearing this for a full day - or if it's a fitting issue. If it's the latter, I have no idea what's causing them. Ideas? Hands in pocket - tight over the bum. Now you are looking at my bum! I made some construction changes too. The pattern came with a sleeve facing, which I don't like, particularly as the instructions have you slip stitch the facing down and then top stitch, which seems kind of pointless. Instead, I made bias binding from an old shirt of P's, and faced the sleeves using that, topstitching in place. I added in seam pockets. I french seamed all seams, including those pockets. I ignored the instructions to hem using seam binding and just did a double turn. It's a nice deep hem, so there was plenty of allowance to do this. I also topstitched it, as I liked the consistency with the other topstitching. I did consider topstitching the side seams, almost fake-flat-felled-like, but I couldn't figure out how to do that without sewing my pockets shut. Finally, I neglected to make the self fabric tie belt, as I don't care for them. I really like the resulting dress. There are a few niggles, which I've mentioned above, but it's absolutely wearable as is. It's quite a plain dress for me, but I like its simplicity. I'm really pleased with my topstitching. This was the first time I've been brave enough to do it in a contrast colour. I picked the buttons to match the contrast thread (and did the buttonholes in the contrast thread too). Two are slightly more purple than blue, which wasn't planned, but which I quite like. It's not hugely noticable, but like the stripey bias binding, it's a detail that makes me smile. Unbelted. It kind of works (pls ignore the creases). I did think about adding another couple of buttons so it buttons right up to the collar, which would give it more of a modern feel, but my collar is wonky. Not noticeable as is, but definitely noticeable when I hold it closed. For a future version though, I think adding a collar stand would be nice. I considered it for this time but ruled it out as I've never sewn a collar stand before, so I thought doing a hack might not be the best place to start. I should probably sew an actual shirt first. Other variations to the pattern would be to add a back yoke, with maybe a pleat, or patch pockets, either on the skirt or as breast pockets. You could add quite a lot more "shirt" details which could be lovely. Or equally I could continue to keep it simple. Buttons - the third and fifth down are a different colour. I'm not sure I'll like wearing this under a cardigan. I just feel a bit mumsy wearing collared things under cardigans. But it might layer over a polo/roll neck or a long sleeve tee. It would have been perfect in summer, when I was meant to make it, paired with my clogs. Next summer. In the meantime I'm wearing it these lovely new shoes, c/o Clarks! Also, I got new glasses! I actually have 2 new pairs. You'll definitely see the other pair in future posts. I really love these pinkish brown ones, but I know they aren't everyone's cup of tea. P took a bit of persuading. What do you think? Finally, I have joined The Fold Line. 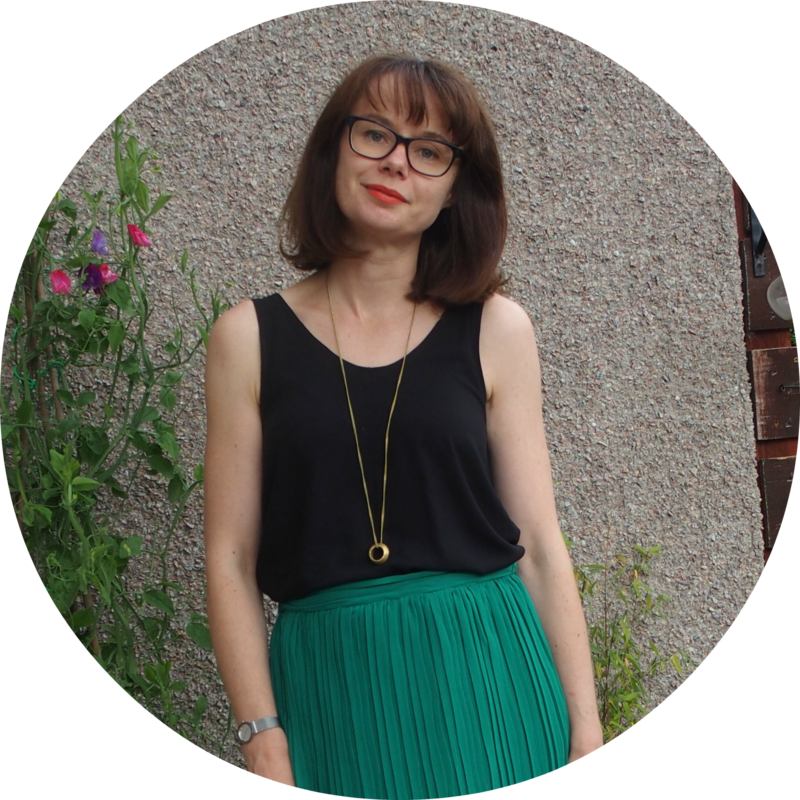 This is a new online sewing community type thingy. If I'm honest, I'm always skeptical* about these things, not least because it just feels too much like hard work to have to post everything I make to a million different social media. I've pretty much given up on Kollabora, I'm rarely on Pinterest or Twitter these days and I hate Flickr since Yahoo took it over. However I thought I would give it a go. You never know, this one might be more like Instagram and keep me hooked. I did have an interesting sign up experience, where I created an acount and then was immediately banned from the site because it thought I was a spammer, but that was all resolved literally within 5 mins of me emailing them. Pretty good customer service! Unsurprisingly, I'm @grosgraingreen if you want to be my friend! And there is a Sewing Scotland group, for those that might be interested! Are you joining? *Is that the correct spelling? It looks really weird, but autocorrect is telling me that "sceptical" is incorrect, and I'm too lazy to get up and check in the actual dictionary.